BBC web site has a brief thermal video of the Sakurajima volcano in Japan erupting. Look at the second part of this video. If you're in New York you have a chance to see an exhibition of the photos from this project of Richard's, called Infra, at the Aperture Gallery at 547 W. 27th St. (On the 4th floor.) More information here. Those of us who can't get to W27th Street can make do with the book, published by Aperture with the Pulitzer Center on Crisis Reporting. The legendary Abe Frajndlich, no slouch when it comes to infrared himself (one of his infrared photos was in the Infrared 100 exhibition), tells me he found the prints on show 'stunning' when he visited an earlier incarnation of this exhibition. As I've said before, good colour film infrared photography is a rare animal, and Richard is a great exponent of this. You should also check out his web site and that of the guy who provides him with his film stock, Dean Bennici who has an amazing collection of colour infrareds on his web site. 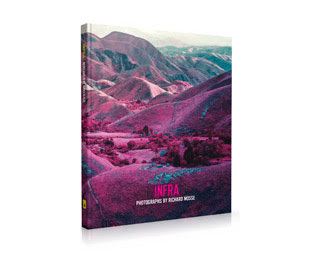 Although this time it's not infrared I should also point you at Abe Frajndlich's latest book, which is the culmination of a long-running project to photograph photographers. Check out this from the New York Times and don't forget to click on the article link at the lower right.